Happy tenth wedding anniversary to the Prince of Wales and the Duchess of Cornwall! Time certainly flies -- it seems impossible that this particular royal wedding was an entire decade ago. Let's have a look at the jewels we saw on the day, shall we? Charles and Camilla were married in a civil ceremony at the Guildhall in Windsor, and Camilla wore a simple white suit and hat. Her jewelry for the first service was relatively simple. Her earrings are pearl drops attached to diamond button studs. The brooch pinned to the lapel of her Robinson Valentine jacket was a gift from Prince Charles. Made of diamonds surrounding a black pearl, the brooch is designed with a Prince of Wales feather motif. At the time of the wedding, newspapers reported that it was one of the jewels commissioned by King Edward VII for Camilla's great-grandmother, Alice Keppel. ...and, of course, her engagement ring, which we discussed in detail here in yesterday's post. Her Wartski-made wedding ring is composed of Welsh gold, as per British royal tradition. The civil ceremony was followed by an Anglican blessing at St. George's Chapel, Windsor. For this service, Camilla changed into another Robinson Valentine creation, a long blue silk gown with delicate embroidery. The pattern embroidered on the dress was reportedly meant to echo the design of a piece of jewelry that had belonged to Camilla's late mother. She also wore a fabulous gold feather headpiece by Philip Treacy. The ends of the feathers were tipped with Swarovski crystals. The Queen wore a cream-colored outfit to the chapel for the blessing ceremony. With her usual pearl earrings and necklace, she wore the Golden Wattle Brooch, a piece given to her by the Australian people in 1954. Charles's sister, Princess Anne, wore one of her impressively-recycled outfits to the wedding. She accessorized with pearls and a gorgeous diamond floral brooch. 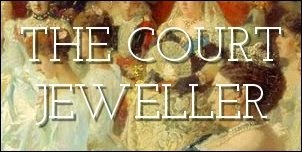 The Countess of Wessex chose a sentimental piece of jewelry for the wedding: a small diamond brooch of interlocking hearts, given to her by Prince Edward as a present on their first wedding anniversary. Zara Phillips wore a dramatic hat, dress, and boots to the wedding; she also donned hoop earrings and a pendant necklace, as well as a large wristwatch. No jewelry, as per usual, from Princess Beatrice of York, but she did wear one of my favorites of all of her fascinators. Princess Eugenie also went sans jewels. But the Duchess of Kent, who is sitting behind Camilla's daughter, Laura, went with major pearls for the occasion. The other Kent ladies, Princess Alexandra and Princess Michael, also wore significant jewelry. Alexandra has a lovely brooch tucked into the neckline of her blouse, while Marie-Christine chose exaggerated floral accessories and large pearls. Marie-Christine's daughter, Lady Gabriella Windsor, let the embroidery on her jacket do most of the accessory work, though she also wore a pair of earrings. ...and her sister-in-law, Lady Sarah Chatto, went with pearls as well. Few foreign royals attended this low-key royal wedding, and those who did were there largely because of their personal ties to Charles. He's close to Constantine and Anne-Marie of Greece, for example.With her pearls, the former Greek queen a sapphire and diamond brooch. I believe this is the same piece she wore in 1989 at her silver wedding anniversary party. The other foreign royals attending were the Norwegian crown princely couple. They're actually the foreign royals with the closest family ties to the current queen. Crown Prince Haakon's grandfather, King Olav, was the son of a British princess; he was actually born on the Sandringham estate. Crown Princess Mette-Marit wore a lovely brooch to the wedding. I can't recall seeing her wear it before or since (if I'm wrong, you know the drill -- let me know in the comments! ), but I'd be curious to know whether it might have connections to Queen Maud, given the occasion and its design.